It was taken when Emma was in Canada for One Young World. "Definitely a highlight of my year was meeting this person. 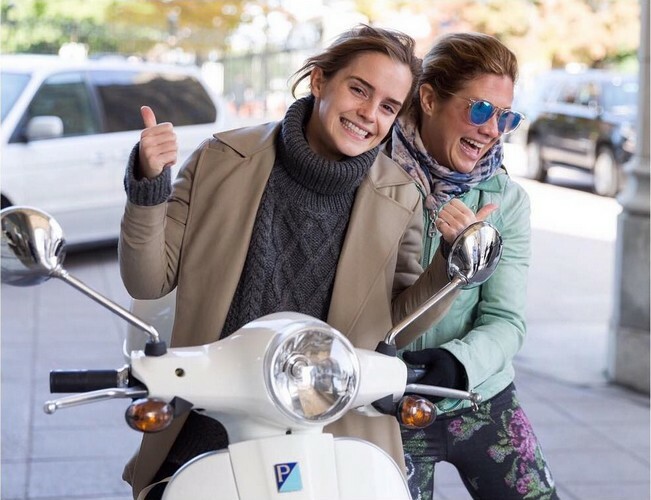 Which First Lady picks you up on a Vespa before your meetings to personally show you why she loves her city and her country? It was one of the most free and inspiring mornings I have had all year- not what I expected from someone who is as busy as she must be. She's a yogi, feminist, artist, advocate, mother, warrior and all round gold hearted person. What a privilege it is to have met her. Welcome to Instagram Sophie! ❤ Bonjour! I'm looking forward to being able to see your adventures and especially witness the work you do on behalf of women and girls. P.s she did the driving and we both wore helmets!"